Welcome to Ken Mills Toyota Service Centre. To book a service for a Toyota vehicle, click on "Book Online". To book a service for all other makes and models, click on "Enquiry". At Ken Mills Toyota on the Sunshine Coast, we make servicing your car as easy and convenient as possible – from driveway service to our courtesy bus to pet-friendly waiting areas. 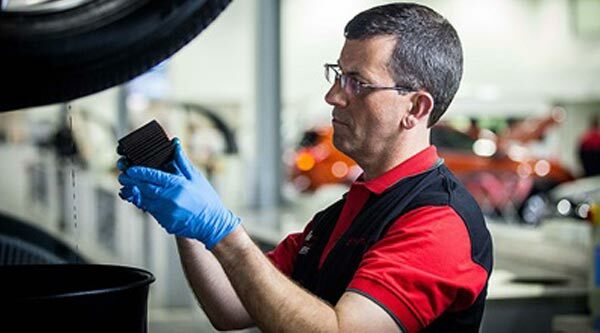 We have two Sunshine Coast service locations, Nambour and Maroochydore, both fully equipped with Express Maintenance bays and specialist Toyota diagnostic equipment. These have been purpose built to support the Toyota maintenance program, which allows you to get the best performance from your Toyota vehicle. However, we service all makes and models of car, not just Toyota's! Additionally, while you know your car is in good hands, so are you! Our customers are welcome to enjoy our Ken Mills Toyota lounge area with plasma television. So, you can relax and enjoy free tea and coffee while your vehicle is being serviced. If you prefer to be dropped nearby, you can avail yourself of our free courtesy bus service. We will call you when your vehicle is ready, and come and collect you. We are also pet-friendly with dog beds and access to water bowls. If you would like to experience why we are the #1 Choice for Locals or if you have any questions, call our Service Team today.